I was first introduced to this in the British Virgin Islands. I really like it because of how thick it is, I used it as a base for my deep conditioner, the recipe for that you can find here. OGX has a few different conditioners and oils in this line and I love them all. It has major slippage and slides through my knots as if they are non-existent. The pricing is in the range about $15-$18 US and can be found at Cherry’s Beauty Salon Locations and Nicole’s Beauty Supplies in Half Way Tree. This one comes in here because of its a little more pricey $15-$20 US. Knot Today has gotten raving reviews from Naturals across the world and in most cases, I can see why. The fragrance is very light, it has slippage and can be used as a leave-in, so essentially its a 2 in 1 product. Major dislike is that it comes in small bottles and because of the price I doubt it would be affordable to get a bigger bottle. The VO5 Conditioners are some of the most cost-efficient conditioners on the market, it comes in a various different light and yummy scents. Vo5 does not have much slippage and I wouldn’t use it as a leave in due to the silicones that are used in this product. It can be used as a mild shampoo substitute as I have found it does do a deeper clean as a conditioner than say a Hello Hydration and a Knot Today. The pricing on this is very affordable less than $8US starting from the largest size. I love the fact that I can find this conditioner anywhere from the gas station mini-mart to the superstores of Mega Mart. I would compare this directly with the V05 Conditioner with fragrance, availability and product performance. 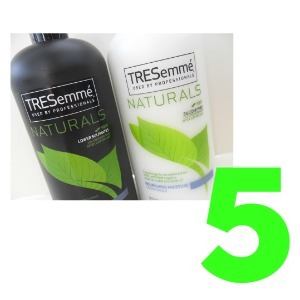 Tresseme comes in large bottles which is awesome but it does not have a pump action sprout like Hello Hydration and other large bottles and makes it hard to re-condition your hair when your hands are all slippery. It has some slippage and does help with detangling the scent is light and refreshing but doesn’t linger for too long. Due to the size of the containers it usually retails upwards of $10 US, however, it available in all Hair Care and Beauty Stores, Mega Stores and Supermarket, the challenge will be to get the Natural hairline that they now offer. This list contains affiliate links, which means if you purchase through these links, I will receive a small commission. This is at no cost to you, but it is an awesome way to help me keep my blog going. Thanks for your support! Since your hair then I know you will be interested in signing up for my Natural Hair Guide that is formulated for your hair type. Its simple just enter your email below and you can get started. GO AHEAD GRAB IT! I have heard wonderful things about the herbal essence hello hydration and will definitely be giving a try soon.